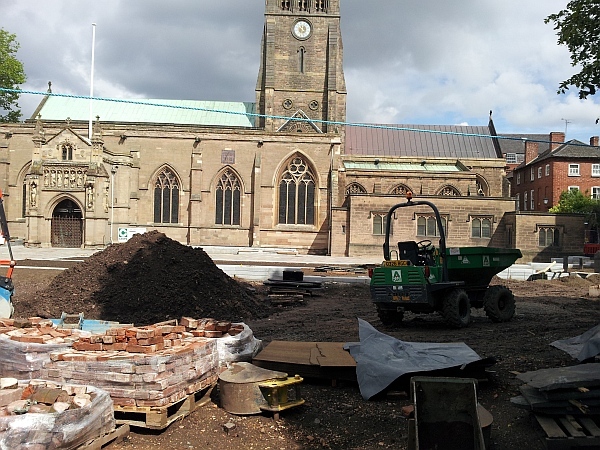 LEICESTER’S new Cathedral Gardens is set to bloom over the next few weeks as work on the ambitious £2million project enters its final stages. 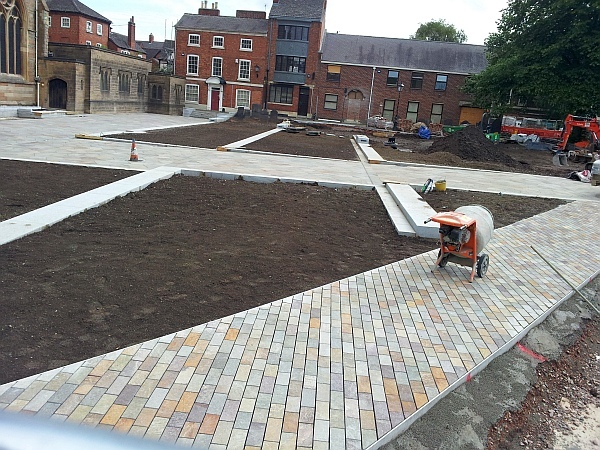 With much of the hard landscaping and paving nearing completion, and work to lay the new lawns now well underway, the new public gardens by Leicester Cathedral are now taking shape. The project is now about to enter a busy few weeks of planting. The first of Cathedral Gardens’ 20 new trees will be planted today (5 June). These will include semi-mature juneberry trees, great white cherry trees and double geans. The gardens will be planted with shrubs and colourful bedding plants over the coming weeks. A single great white cherry tree will also be planted on Guildhall Lane, as part of work to create a new area of seating in the cathedral’s former private car park. Work to reinstate 50 decorative headstones is also underway. 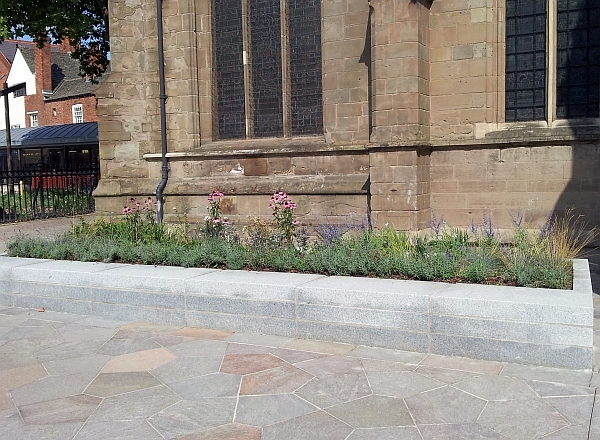 The headstones, which were carefully removed during the first phase of work at Cathedral Gardens, have been professionally restored and will stand in what is to be known as the ‘Churchyard Garden’. Others have been given a new home at Leicester’s Welford Road Cemetery. 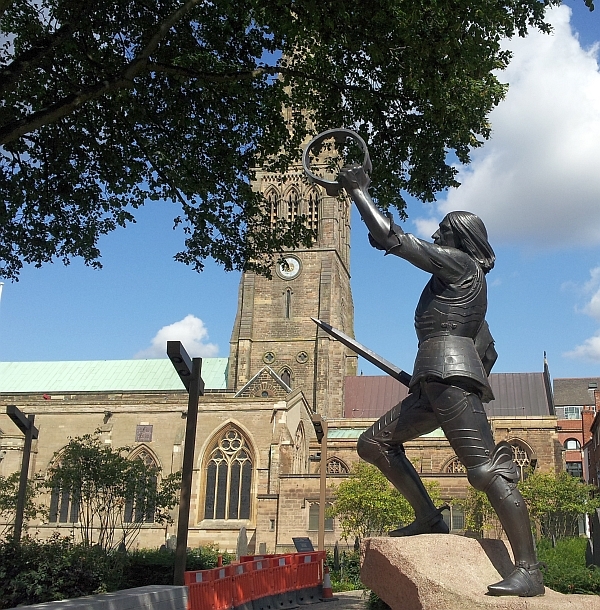 Leicester’s statue of King Richard III is also due to be reinstated at Cathedral Gardens later this month. The statue, which was given to the city by the Richard III Society in 1980, is currently undergoing restoration work at the studios of Lincolnshire-based Hirst Conservation. Installation of a new artwork commemorating the life, death and discovery of Richard III will also begin in June. The artwork, entitled ‘Towards Stillness’, has been commissioned by Leicestershire County Council and created by Dallas Pierce Quintero . It will provide a centrepiece to a new ‘Master’s Garden’ being created on the original site of Wyggeston Hospital on the St Martins House’s former car park. People will get a first chance to see Cathedral Gardens for themselves when it officially opens to the public on Saturday, 5 July. A full programme of free events to mark the opening celebrations will be unveiled in the coming weeks. Work on Cathedral Gardens is being carried out by specialist contractors P Casey (Land Reclamation) Ltd. The same company is also constructing the nearby Jubilee Square. 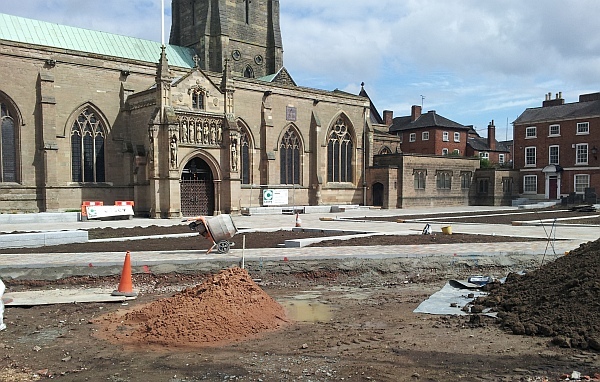 The £2.5million Cathedral Gardens project, which also includes resurfacing and other improvements along Peacock Lane, is being funded by the Diocese of Leicester, Leicester City Council and private donations, with support from Leicestershire County Council. The project was awarded up to £1milllion for the European Regional Development Fund.